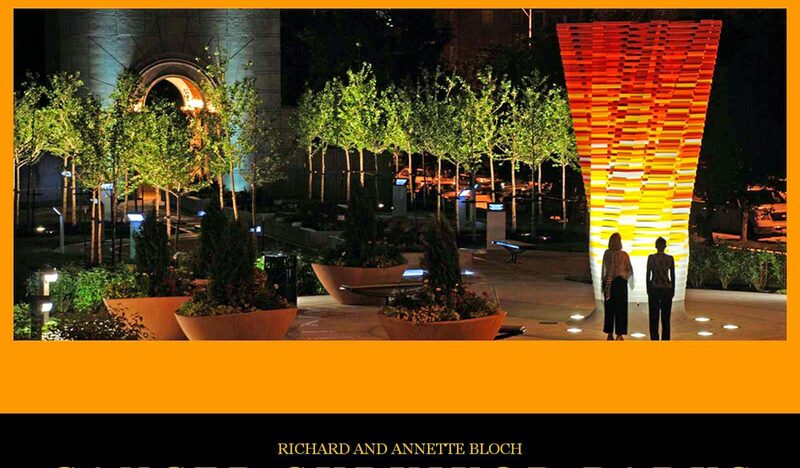 One of the three elements in a Richard and Annette Bloch Cancer Survivors Park is a Road to Recovery. This consists of seven plaques offering common sense suggestions on fighting cancer. CANCER: Cancer is the uncontrolled growth of cells. Even though it is not the largest killer, it is the most feared disease in America because it is not understood. If we understood cancer, we would not be as afraid of it. It is estimated that the average individual has a wildly dividing cell six times a day. The immune system recognizes this, kills it, and we never know the difference. When the immune system lets down, even temporarily, and these dividing cells get established to the point that the immune system cannot control them, we have cancer. COMMITMENT: The biggest and the hardest single thing that you will be required to do in the entire battle is to make up your mind to really fight it. You must, on your own, make the commitment that you will do everything in your power to fight your disease. No exceptions. Nothing halfway. Nothing for the sake of ease or convenience. Everything! Nothing short of it. When you have done this, you have accomplished the most difficult thing you will have to accomplish throughout your entire treatment. KNOWLEDGE: Knowledge is a cancer patient’s best friend. The more you know about your disease, the better your chances are of beating it. Find out everything you can about your disease. Knowledge heals; ignorance kills. Read the book Fighting Cancer, available free from 800-433-0464. TREATMENTS: Find a qualified physician who believes you can be successfully treated. Get an independent second opinion to be certain you are doing everything possible correctly. Do everything your physician suggests and do everything you believe might help that your physician says will not hurt. You are the boss. This is your life. PHYSICAL WELFARE: Eat a well-balanced diet to maintain an effective immune system. Do not go on any fad diets at this time. Exercise as much as you comfortably can. Be selfish, think of yourself first, and do not overdo. To improve your chances of success and for practical constructive suggestions on actions to take, call 800-433-0464 to talk with a volunteer who has overcome the same cancer as you. MENTAL WELFARE: There are many mental exercises that could help your recovery and cannot possibly hurt. Relaxation exercises are strongly recommended as stress accelerates cancer growth. Visual imagery has been demonstrated to improve the chances of success. Prayer by individuals unknown to the patient have been clinically demonstrated to improve the chances of success, so prayers by the patient could certainly help and can not hurt. Make certain your attitude is receptive to successful treatment and keep a positive outlook. SUMMARY: Fighting cancer is not a simple matter of thinking positively, wishing it away and saying, “Hey, doc, cure me.” It is a matter of educating yourself about every detail and mustering all your resources. Use every drop of energy in an organized fashion to constructively concentrate on getting rid of cancer. Most cancers can be successfully treated, but generally you have only one chance. If you miss that first chance, if you don’t do everything in your power, often there is no second chance. This is why no cancer patient can afford the luxury of looking back and saying, “I wish I would have….” Never look back. Concentrate on this moment forward and do everything in your power. There is no downside risk. Now you may have a chance. I was diagnosed a week ago with colon and liver cancer. From schratch, I was very positive and I have told my friends and family to be positive, we believe absolutely in the faith of God. Since my diagnosing, the acceptance thereof and a drastic change in my diet, I feel already better than the past four weeks. You are right to ask your family to be positive about this. Fighting cancer is made bearable when your team is at your side. I am sure that “Team Johan” will keep you motivated and will encourage you every inch of the way. Our best to you. Previous PostPrevious Annette Bloch Co-Chairs Cancer Survivorship Effort. Next PostNext Latest Links – New Resources For You To Consider.